Imperial Oil’s Ontario regional headquarters was truly a building of the Automotive Age, meant to be perceived not by pedestrians strolling the sidewalk, but from behind the wraparound windshield of a Buick Electra at speed. 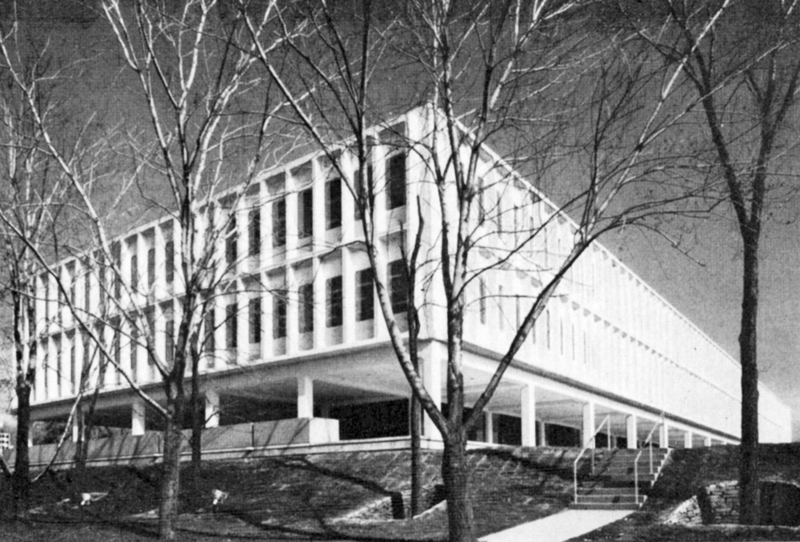 Completed in 1962 on a verdant hillside at 825 Don Mills Road, overlooking the busy intersection of Don Mills Road and Eglinton Avenue, the Imperial Oil building was as long as a football field and sleekly clad in an endless grid of sculpted white precast panels. John B. Parkin Associates designed Imperial Oil with Classical formality and the rectilinear lines of the International Style. The ground floor was recessed some 20 feet and clad in dark plum-coloured brick, making the building appear to hover above the site. Exposed structural columns defined a broad south-facing podium, fronted with reflecting pools, fountain jets and a row of spotlights to light up the facade at night. The main lobby, accessed from a large surface parking lot at the rear, offered views of traffic whizzing by through floor-to-ceiling glass. A technical innovation was the neoprene seals between the window glass and precast panels, used for the first time in Canada, which eliminated bulky metal window frames. Imperial Oil was awarded a 1964 Massey Medal for Architecture and an honourable mention at the Sao Paulo International Biennale of Architecture and Design. The building was not to last, however. Imperial Oil moved out in the early 1990s and, with the commercial office market flatlining, the building was summarily demolished. Its site is now the parking lot of a big-box supermarket. Only the crumbling stub of the service drive remains. Neighbouring Wynford Drive is still lined with fine examples of 1960s Modernist buildings, including A.C. Nielsen at 39 Wynford Drive (Peter Dickinson Associates / Webb & Menkes, 1963, altered), Texaco Canada at 90 Wynford Drive (Bregman & Hamann, 1968), Bell Canada at 100 Wynford Drive (Webb Zerafa Menkes, 1969), and the Japanese Canadian Cultural Centre at 123 Wynford Drive (Raymond Moriyama and Associates, 1963). 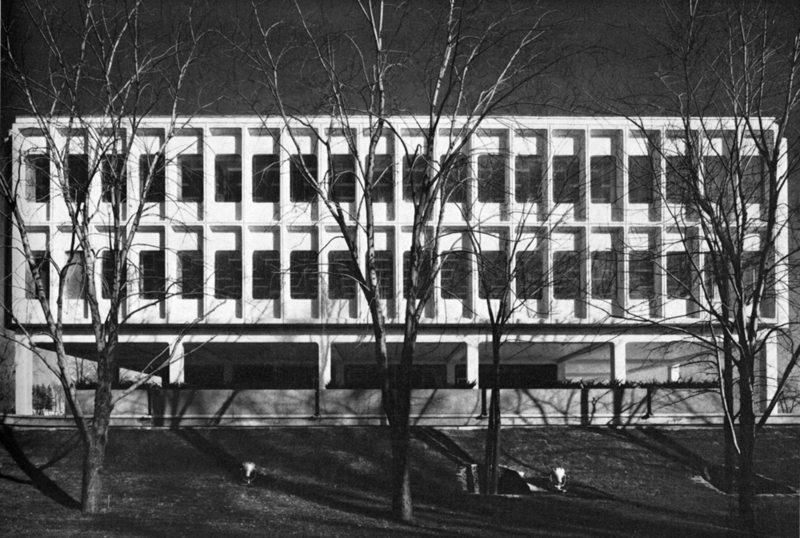 The Bata International headquarters at 59 Wynford Drive (John B. Parkin Associates, 1965), a further development of the Imperial Oil concept, has been demolished, as have Oxford University Press at 70 Wynford Drive (Fairfield & Dubois, 1963) and Shell Canada at 75 Wynford Drive (Webb Zerafa Menkes, 1966). 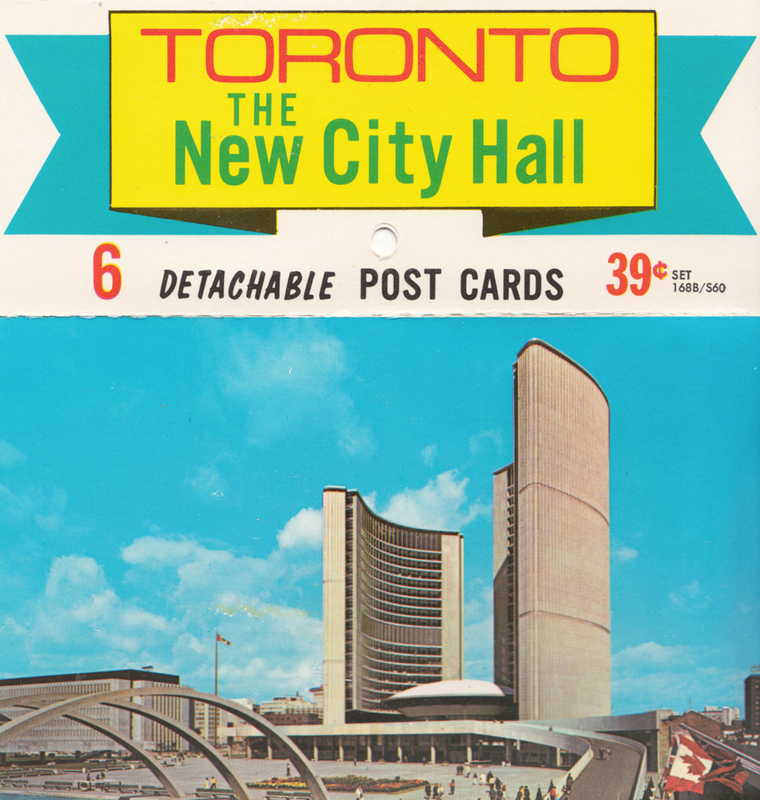 Opened to great fanfare on September 13, 1965, the New Toronto City Hall represents Toronto’s break from its parochial past and its emergence as a dynamic, forward-looking international metropolis. 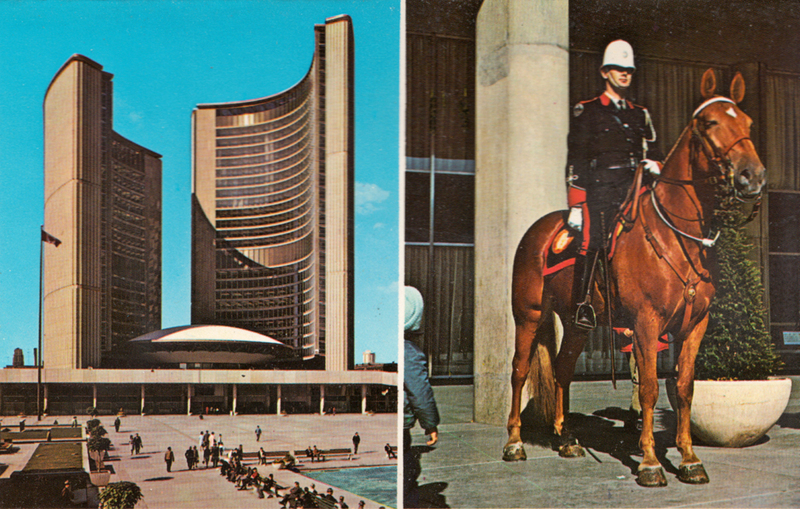 These postcard images depict the building immediately after completion; Henry Moore’s famed bronze sculpture The Archer was not unveiled on Nathan Phillips Square until October 1966. 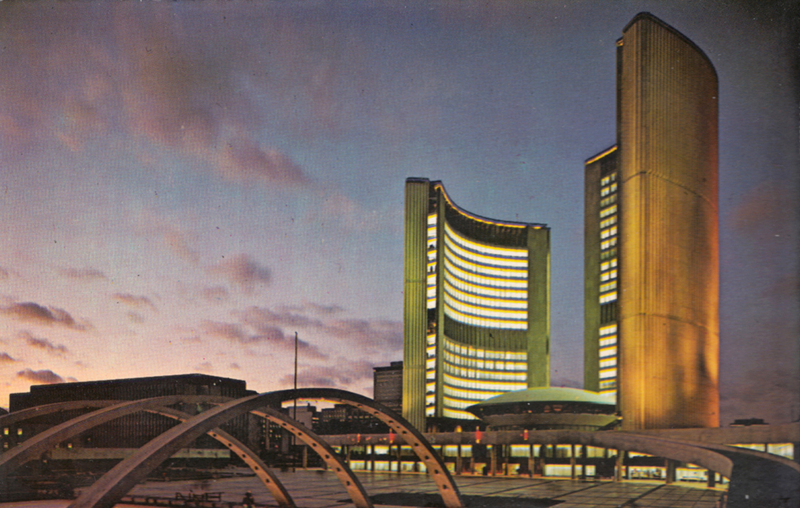 City Hall was designed by Finnish architect Viljo Revell, winner of an international design competition that drew over 500 entries from 42 countries and was adjudicated by architectural luminaries such as Ernesto Rogers, Eero Saarinen and Sir William Holford. 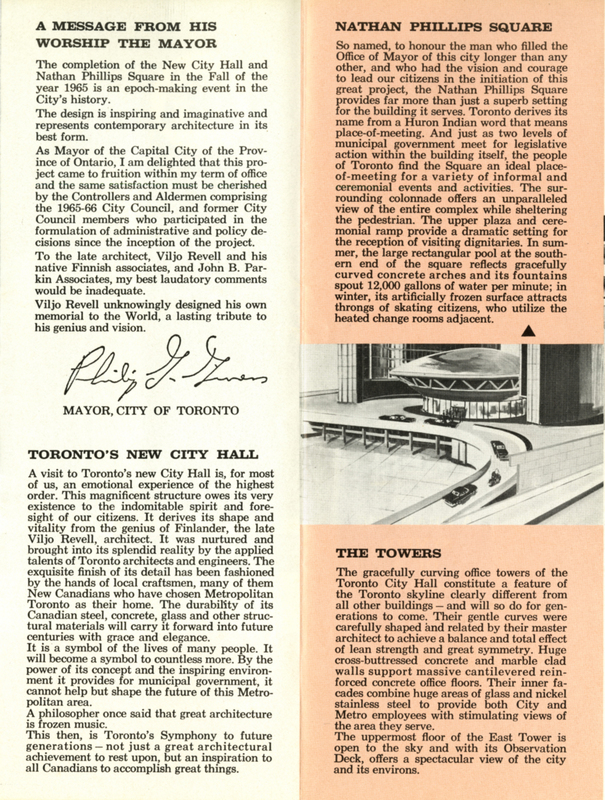 Revell’s flamboyantly sculptural and expressionistic masterpiece—two curving office towers cupping a saucer-shaped council chamber, atop a wide, low podium—has long transcended its initial controversy and established itself as a beloved Toronto landmark and a timeless icon of Modernism in Canada. 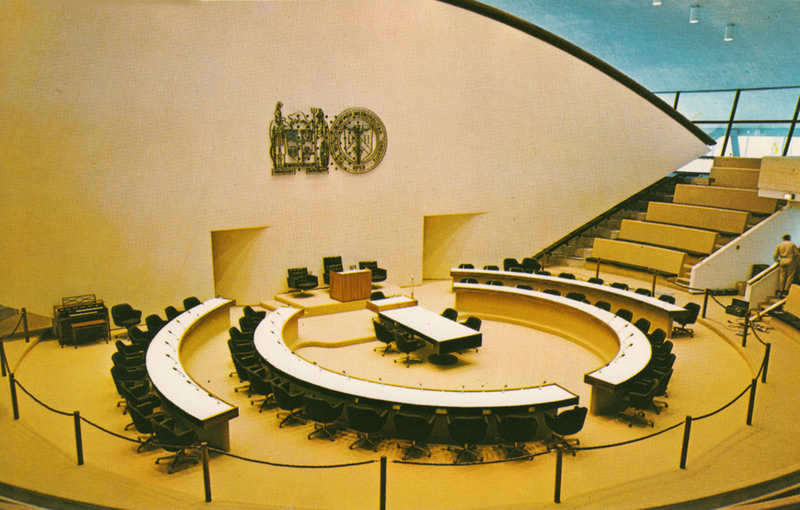 Elevated above the podium as the focal point of Revell’s composition, the council chamber symbolizes the primacy of the city’s democratically-elected representatives. Measuring 155 feet in diameter and some 40 feet to the peak of its domed ceiling, the clear-span concrete shell hovers over the circular central assembly space and public gallery. A continuous band of glass between the upper and lower shells provides indirect daylight. The central lobby is dominated by the Hall of Memory war memorial. 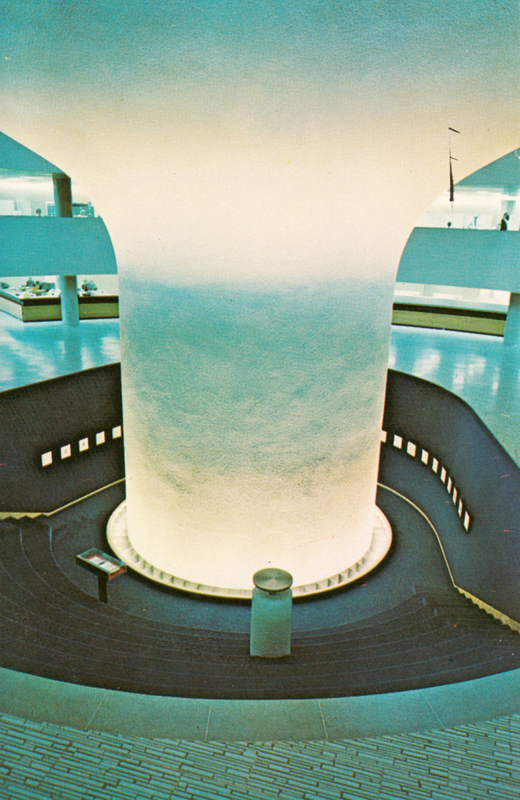 A massive mushroom-shaped column bursts upward from a sunken amphitheatre, supporting the council chamber above and flooded with light from below. Regimental insignias line the amphitheatre wall; in the foreground are the Book of Remembrance and a cylindrical time capsule. Inside the lobby itself, the curving shapes of structural columns, freestanding staircases and the Hall of Memory are contrasted by the straight lines of the aluminum ceiling panels and strips of white Botticcino marble set into the floors. Main doors, stair railings and other interior fittings are of heavy laminated teak, the rich wood tones adding warmth to the predominantly grey and white environment. 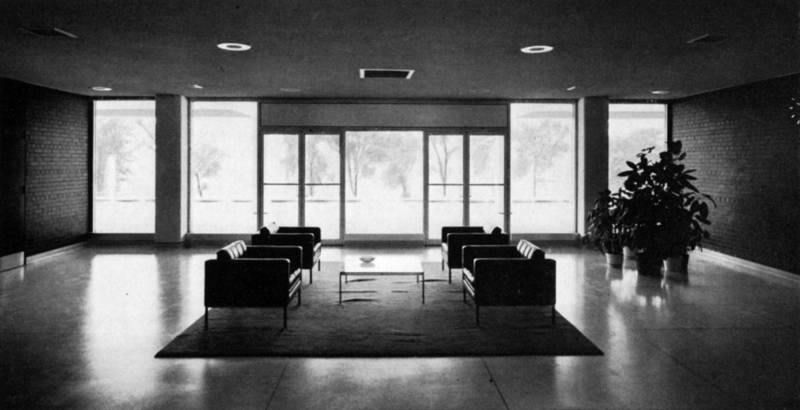 Original interiors by Knoll International included furniture by Eero Saarinen, Mies van der Rohe and Warren Platner as well as custom Knoll-designed desks and benches of precast concrete. 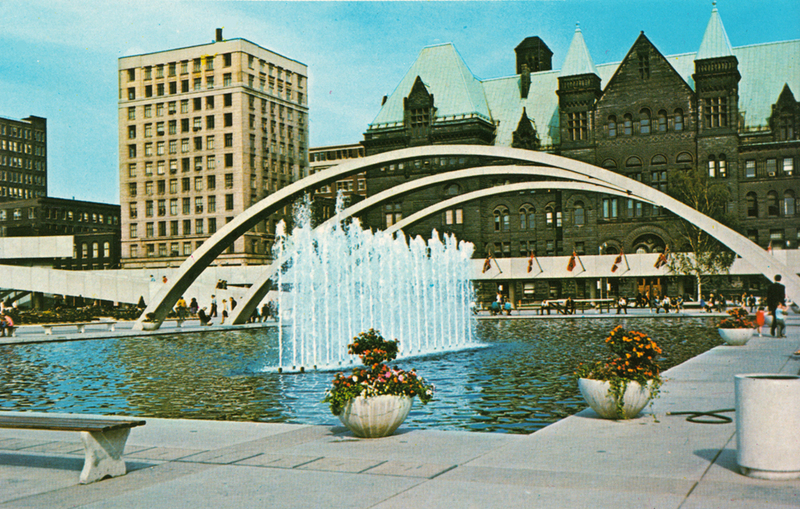 Key to the success of City Hall is Nathan Phillips Square, an expansive civic plaza that visually frames the building and provides much-needed open space in Toronto’s downtown core. Its rectangular reflecting pool, spanned by three concrete arches, is a popular summertime oasis and in winter becomes an ice rink for throngs of enthusiastic skaters. The square is presently undergoing a revitalization that will restore much of its original spatial qualities while introducing new amenities and sustainable green spaces. 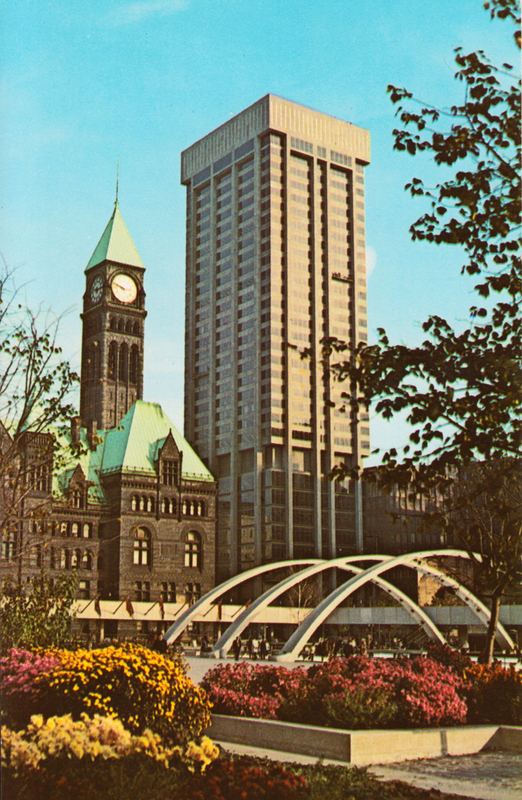 Prominently located opposite Old City Hall and Nathan Phillips Square at 401 Bay Street, the 32-storey Simpson Tower, completed in 1969 for the Robert Simpson department store chain, punctuates the northern gateway of the Bay Street skyscraper canyon. The Simpson Tower was designed by John B. Parkin Associates and Bregman & Hamann in joint venture. One could be forgiven for assuming the building’s bottom third was designed by one firm and the top two-thirds by the other, and that they didn’t compare notes during the process. Lower storeys are glassy and transparent, while the tower section, separated by an inset mechanical floor, appears paradoxically heavy and opaque, largely clad in precast concrete and emphatically terminated by a deep penthouse cap. These disparate elements are barely held together in an oddly compelling visual tension by the prominently extended structural columns. The first three floors are angled back several feet from the Bay/Queen corner, a thoughtful urban gesture that eases pedestrian flow and enhances views of Old City Hall. Construction of the Simpson Tower completed the Simpson’s complex, begun in 1895 with a six-storey department store at Queen and Yonge and gradually expanded to fill the entire block. As planned, the next phase of development would have enveloped the adjoining store in horizontal bands of bronze-toned metal cladding. Uncertainty about connections to the proposed Eaton Centre delayed construction, however, and as preservationist sentiment grew, Simpson’s instead opted to restore the store’s historic Chicago School and Art Deco facades. 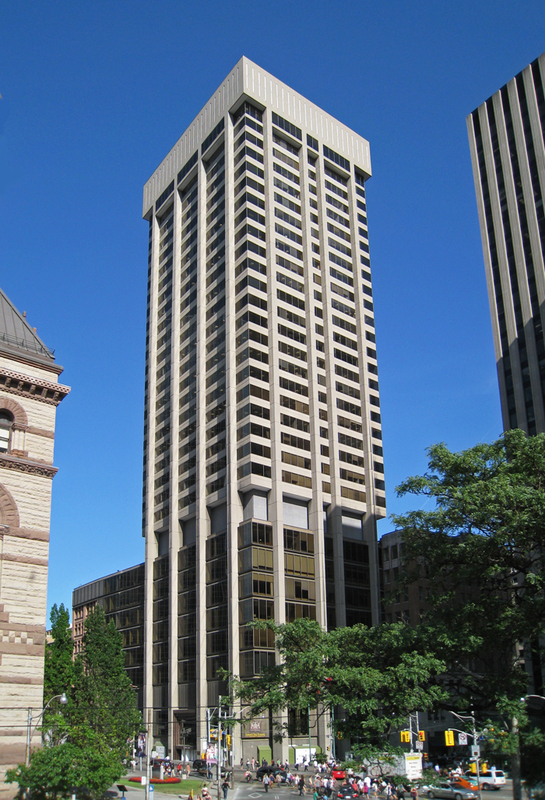 In 1978 the Simpson Tower was acquired by the Hudson’s Bay Company as part of its purchase of Simpson’s, and the building has since housed the executive offices of HBC and its subsidiaries. 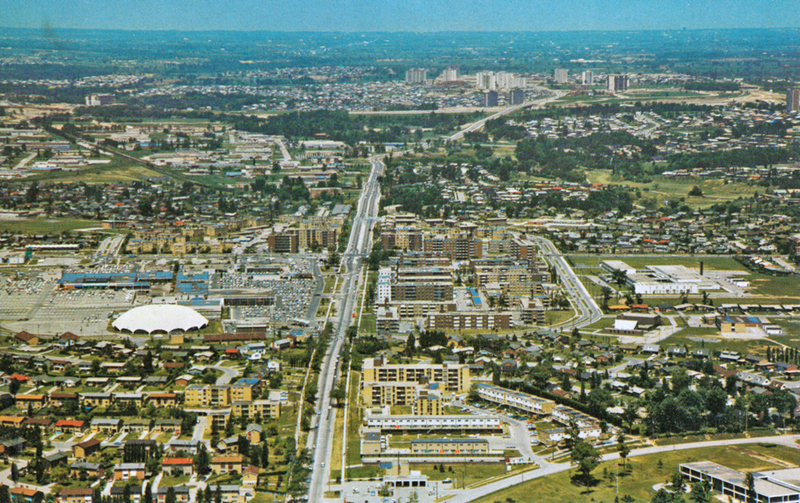 Established in 1952 as a self-contained new town for 32,000 residents, Don Mills was Canada’s first garden city and a model for postwar suburban developments across the country. Don Mills began with industrialist E.P. Taylor assembling some two thousand acres of farmland seven miles northeast of downtown Toronto. Taylor appointed the young Harvard graduate Macklin Hancock as director of planning, and in creating Don Mills Macklin drew upon Ebenezer Howard’s pioneering Garden City and Clarence Stein and Henry Wright’s Radburn. 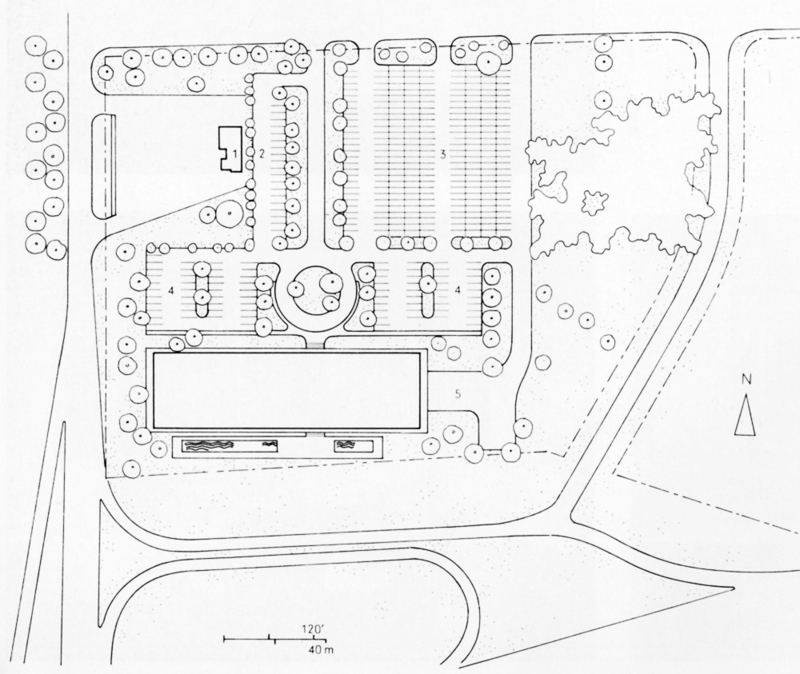 In accordance with garden city principles, four neighbourhood quadrants surrounded a town centre of commercial buildings, community facilities and high-density housing, which was bisected by Don Mills Road and Lawrence Avenue and encircled by The Donway ring road. Vehicles were separated from pedestrians: The Donway separated the town centre from the neighbourhood quadrants, pedestrian walkways linked neighbourhoods and the town centre, and vehicular traffic within neighbourhoods was slowed by winding streets, cul-de-sacs and T-junctions. A greenbelt around the community was developed to buffer suburban encroachment, and connected to a system of neighbourhood greenspaces as well as the ravines and valleys of the Don River. Existing trees and natural landscape features were retained wherever possible. The integration of clean industry allowed residents to both live and work in Don Mills, a key differentiator between a garden city and a dormitory suburb. A consistent Modernist aesthetic was ensured by the Don Mills Development Corporation’s control over architectural design, colours and materials; all houses and buildings in the original development were designed by company-approved Modernist architects such as John B. Parkin Associates, Venchiarutti & Venchiarutti, Henry Fliess, James Murray, Irving Grossman and Michael Bach. The above postcard, published c. 1968, looks north up Don Mills Road through the town centre (click on image to enlarge). The white igloo-shaped dome (1) is the Don Mills Curling Rink (William S. Hall, 1960; demolished); directly behind it is the Don Mills Civitan Arena (Crang & Boake, 1960). 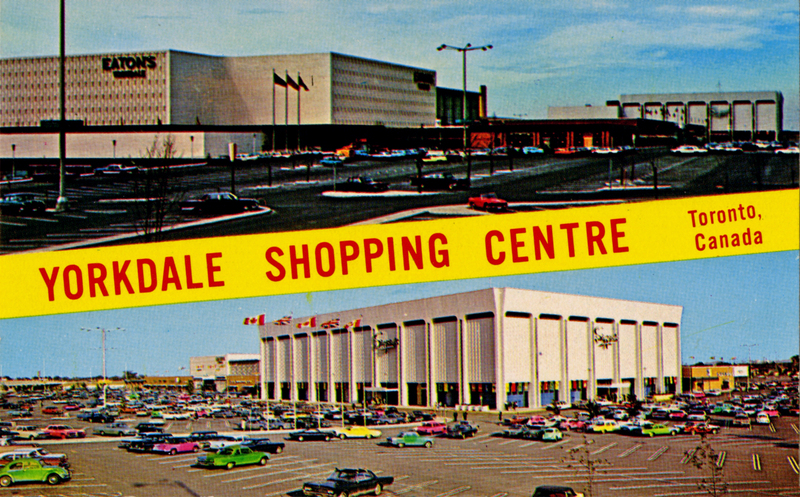 (2) is the Don Mills Convenience Centre (John B. Parkin Associates, 1955; demolished), Don Mills’ central shopping plaza and a silver medal winner in the 1955 Massey Medals for Architecture competition. Just across Lawrence Avenue is the diamond-roofed Don Mills Library (3) (Craig, Madill, Abram & Ingleson, 1961). Forming a dense residential core opposite the commercial and recreational facilities are clusters of mid-rise apartment buildings (4) by various architects. To the east is Don Mills Collegiate (5) (John B. Parkin Associates, 1959), the community’s junior and senior high school. (6) is St. Mark’s Presbyterian Church (John B. Parkin Associates, 1963). An early example of the many well-designed row-housing developments in Don Mills is Greenbelt Heights Village (7) (Belcourt and Blair, 1958). In the bottom right corner is the Ortho Pharmaceuticals office and plant (8) (John B. Parkin Associates, 1955), recipient of a 1958 Massey silver medal and a Canadian prototype for innumerable corporate headquarters. In the distance is Highway 401 and Toronto’s ever-expanding suburban periphery. Before gaining international renown for Scarborough College, Gund Hall at Harvard University and the iconic CN Tower, John Andrews was a young architect at Toronto’s John B. Parkin Associates. 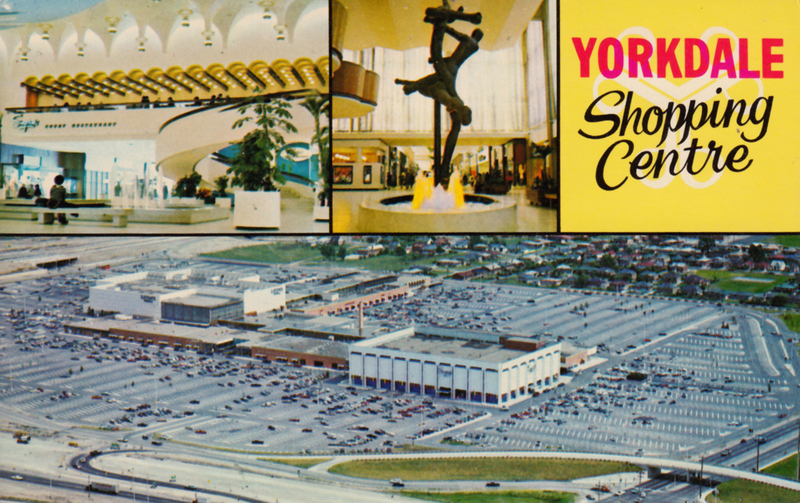 During his tenure at Parkin he designed the Simpson’s department store at Yorkdale Shopping Centre, opened in early 1964 as the largest indoor shopping mall in the world and a landmark in the development of suburban Toronto. 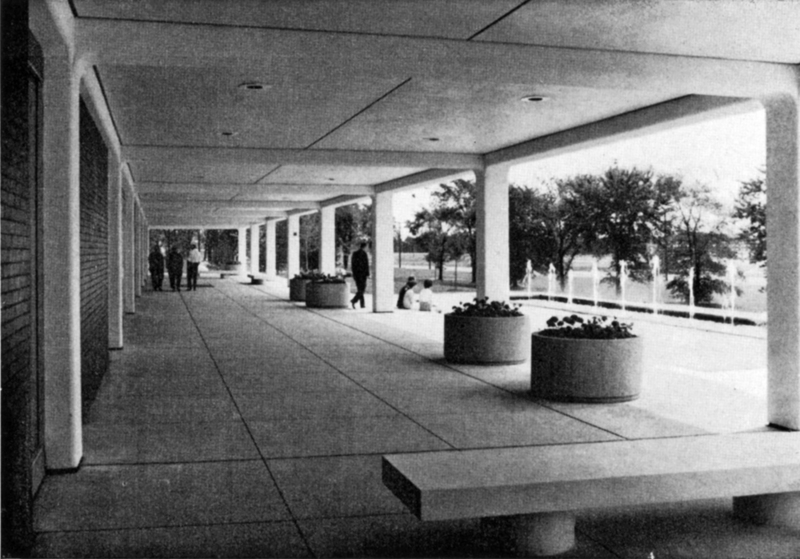 In contrast to the raw concrete and sculptural forms of Andrews’ later Brutalist work, the Simpson’s store shows the influence of New Formalism, a fanciful, decorative neoclassical style popularized in the late 1950s and early 1960s by American architects Edward Durell Stone and Minoru Yamasaki. Accordingly, pairs of arched columns line the perimeter of the building, curving upward into deep parapets that gently flare outward at the top. The precast concrete cladding, when new, was a pristine white and glittered with Georgian quartz aggregate; inset wall panels at the ground level were Simpson’s blue. The building’s careful detailing extended to the undersides of the entrance canopies, which were decorated with candy stripes of glass tiles in brilliant orange shades. Originally opening onto the mall was Simpson’s Court, a high-ceilinged, airy public space with marble and terrazzo floors, a reflecting pool, splashing fountains, tropical plants and a winding helicoidal staircase leading to a restaurant overlooking the court below. Spotlights set into a ceiling of undulating Moorish arches provided a final exotic touch. 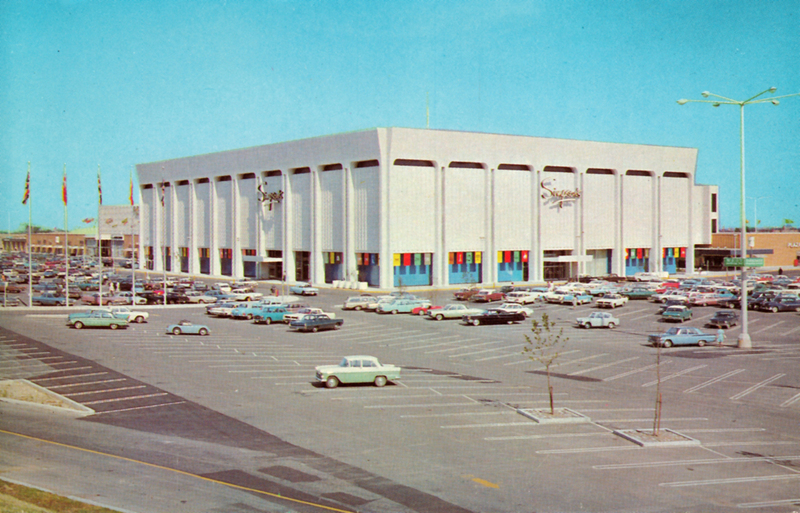 In 1978 the Hudson’s Bay Company acquired Simpson’s, and in 1991 Simpson’s Yorkdale was remodeled as a Bay store after the Simpson’s brand was discontinued. The building’s exterior remains much the same, although the white concrete panels have become badly discoloured. Simpson’s Court has been largely subsumed by rows of cosmetics boutiques. Born in Australia, John Andrews received an architectural degree from the University of Sydney before entering the Graduate School of Design at Harvard University. 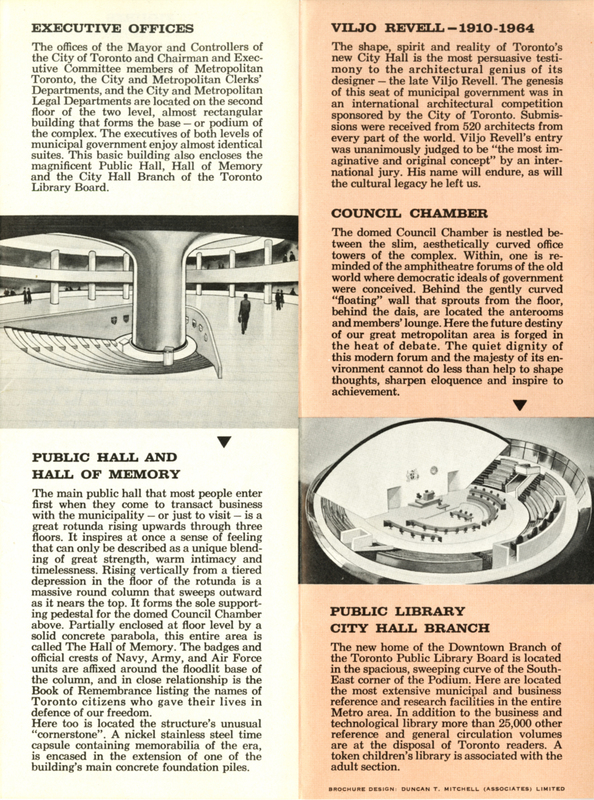 A submission by him and three Harvard classmates was selected as a finalist in the Toronto City Hall competition, which led to his recruitment by John B. Parkin Associates in 1958. 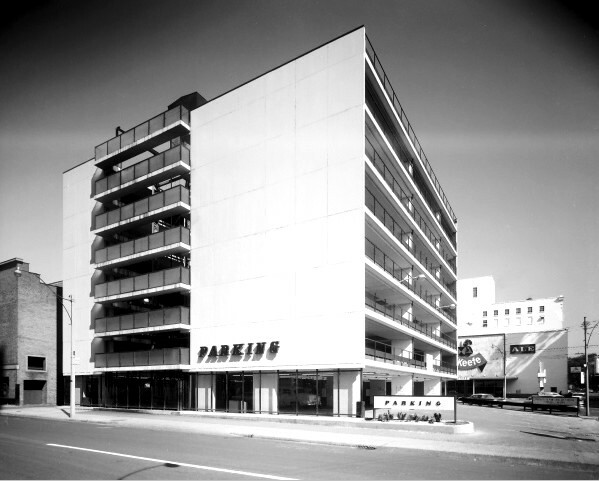 Among the buildings he was responsible for during his three years with Parkin were the Primrose Club (273 St. Clair Avenue West, 1960; demolished), the Federal Equipment plant and offices (88 Ronson Drive, 1960), Bawating Collegiate and Vocational School (750 North Street, Sault Ste. Marie, 1961; demolished) and the control tower at the new Toronto International Airport (1964; demolished). In 1962 Andrews established his own firm and became chairman of the University of Toronto’s school of architecture, a position he held until 1967. His North American work during the 1960s and 1970s includes Scarborough College, the South Residence at the University of Guelph, the Weldon Library at the University of Western Ontario, the proposed Metro Centre redevelopment of the Toronto railway lands, the Miami Seaport Passenger Terminal, Gund Hall for the Graduate School of Design at Harvard University and, probably most famously, Toronto’s CN Tower. In 1972 Andrews returned to Australia, where his best-known buildings include the King George Tower in Sydney, the Cameron Offices for the Australian federal government in Belconnen, Canberra and convention centres in Sydney, Melbourne, Perth and Adelaide. He retired from full-time practice in the early 1990s with many honours, among them a Massey Medal and an OAA 25-year award for Scarborough College, a Gold Medal from the Royal Australian Institute of Architects and an Honor Award from the American Institute of Architects. 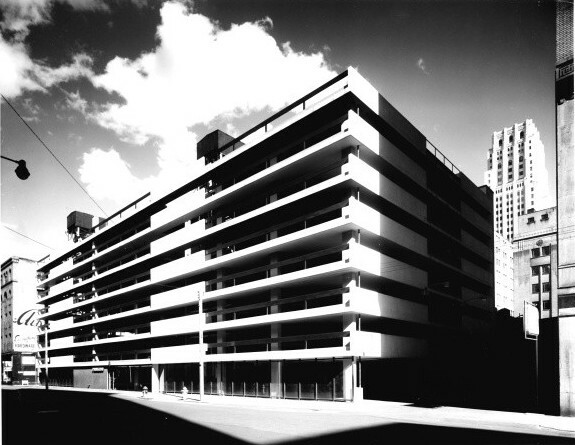 Few building types receive less architectural attention than the lowly parking garage. While there are some high-design exceptions—Paul Rudolph’s 1962 Temple Street Parking Garage in New Haven, Connecticut and Herzog & de Meuron’s recent 1111 Lincoln Road garage in Miami Beach are two—the vast majority of garages are at best anonymous and utilitarian. Toronto’s first attempt at parking with style was a pair of garages at 29 Temperance Street and Dundas Square, designed by John B. Parkin Associates for the Parking Authority of Toronto and opened in 1957. To maximize car capacity on the constricted sites, the garages featured then-novel mechanical parking systems. Rather than circling around a series of ramps, drivers simply entered the garage, stopped on a hydraulic elevator platform and exited their vehicles. An attendant then raised the car to its allotted bay and slipped it into place. 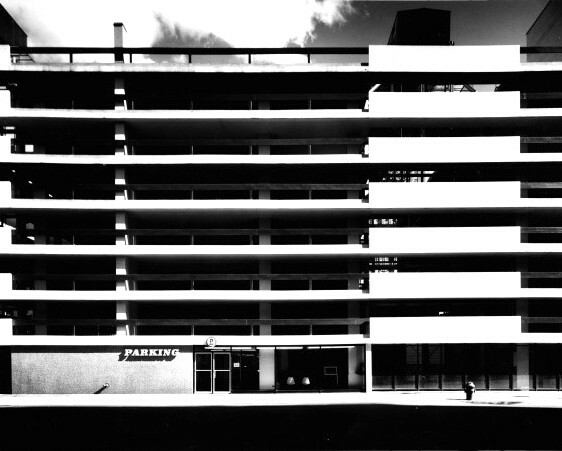 The clean, rectilinear lines of the Parkin garages belied the tailfinned automobiles housed within: black steel railings and window frames crisply contrasted with the pristine white concrete structures, the solids and voids creating a dynamic three-dimensional effect of advancing and receding planes. 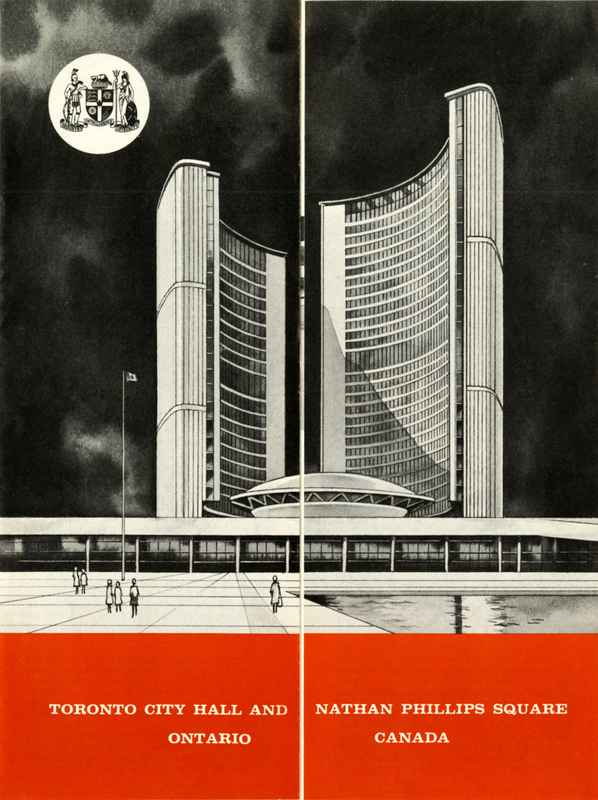 The Dundas Square garage received an honourable mention in the 1958 Massey Medals for Architecture competition and both were published in the 1961 book New Buildings in The Commonwealth. Unfortunately, despite their Tomorrowland promise, the garages were operational disasters. The lifts were unable to keep pace with the volumes of cars during the morning and evening rush hours, causing lengthy backups, and the salty slush and freezing temperatures of Toronto winters led to premature wear and chronic breakdowns of the mechanical and hydraulic systems. Both garages were demolished in the mid-1960s after less than a decade of service. Although common in Europe for decades, mechanical and automated parking systems have been rare in North America. But they are increasingly finding favour for condominium buildings in Toronto as well as New York, Chicago and other space-challenged cities, suggesting that pushbutton parking may be coming soon to a garage near you—if it hasn’t already.